The Colca Valley in southern Peru is home to staggering landscapes of deep canyons, active volcanos and a fascinating ancient ethnic culture. 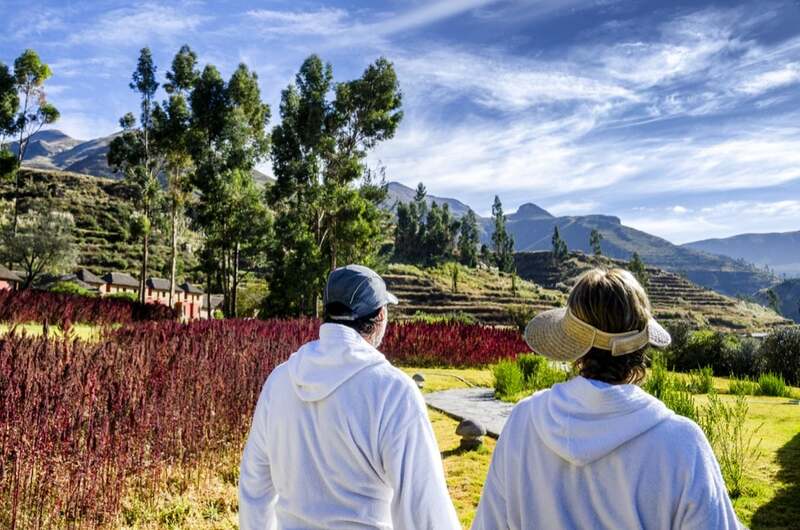 A visit here is a chance to reconnect with the earth and there’s nowhere better to do this than the Colca Lodge Spa & Hot Springs. 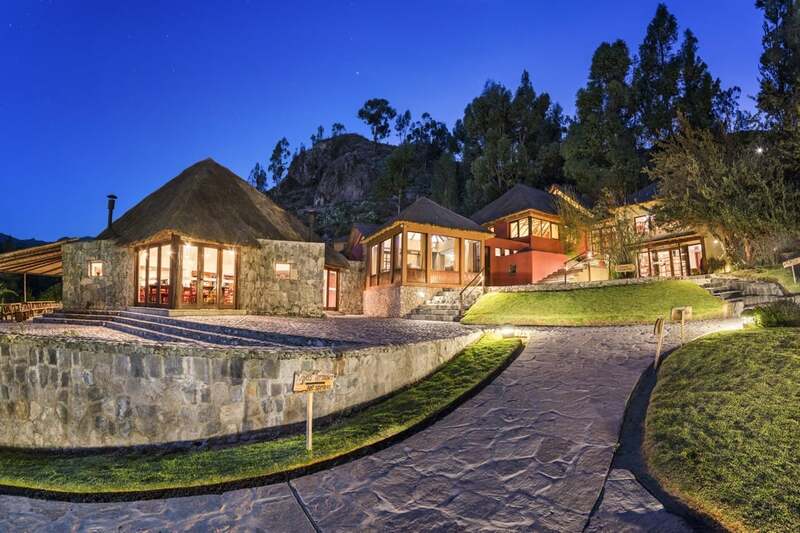 Colca Lodge Spa & Hot Springs is situated 3,250 metres above sea level and two-and-a-half hours from the colonial-era city of Arequipa, on the banks of the River Colca. 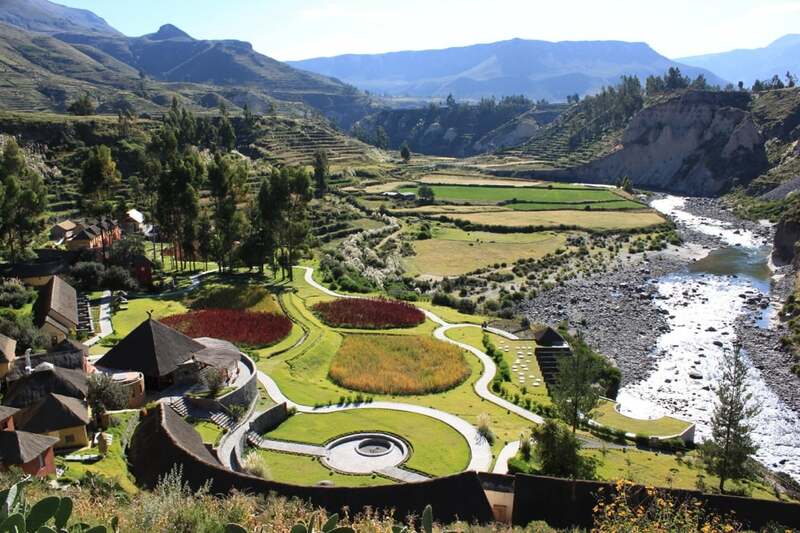 The lodge is surrounded by hundreds of pre-Inca agricultural terraces that have been declared a Peruvian National Heritage Site. 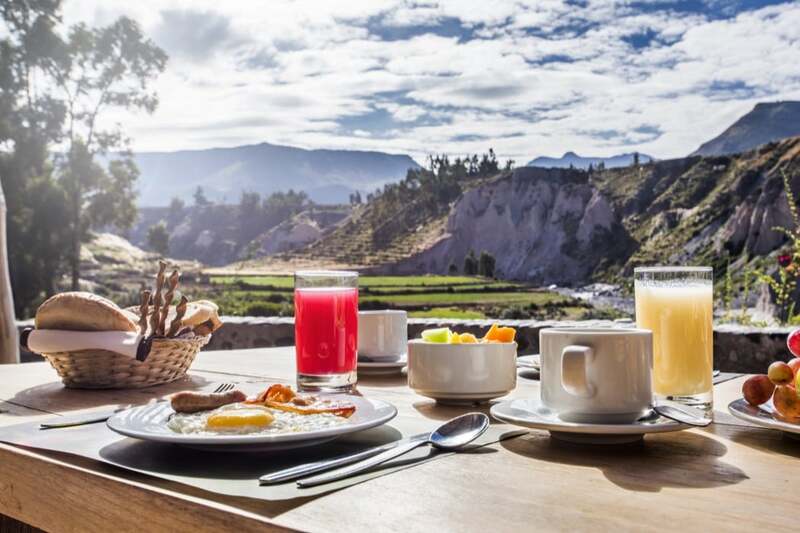 There is much to explore in the Colca Valley, among the mountains of the Western Andes you’ll find the world’s deepest canyon, the highest chain of active volcanoes on the planet and one of the world’s largest flying birds – the condor. 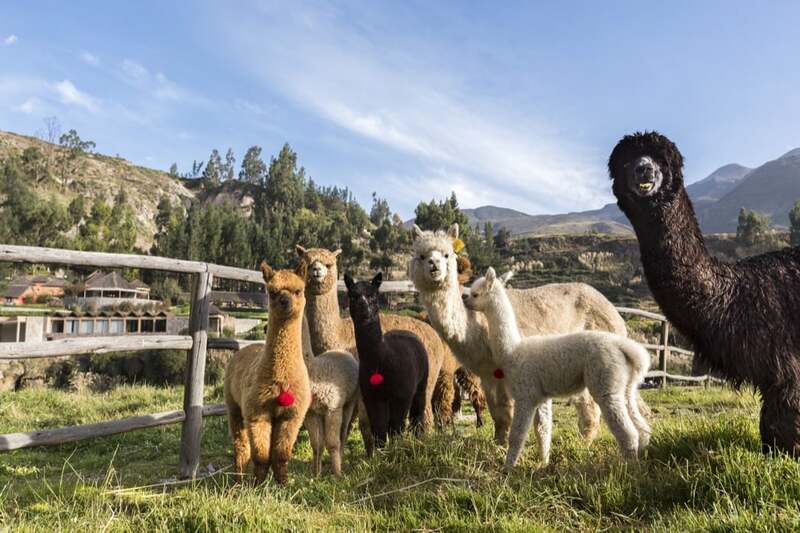 It’s also home to some of the purest and oldest Peruvian ethnic groups: the Collahuas and the Cabanas. Pre-Incan ruins at the Uyo Uyo Archaeological Site are near to the hotel and are definitely worth a visit, and make sure you take the short walk to see the lamas and alpacas as the hotel has it’s own Alpaca Ranch. Your surroundings are a vital part of your stay here; experience the special energy of this spectacular landscape, where the river meets the sky, sun and moon. Inside the lodge uses natural design inspired by the old pre-Inca structures, making use of natural materials, earth, stone and straw. The effect is rustic but subtlety luxurious. 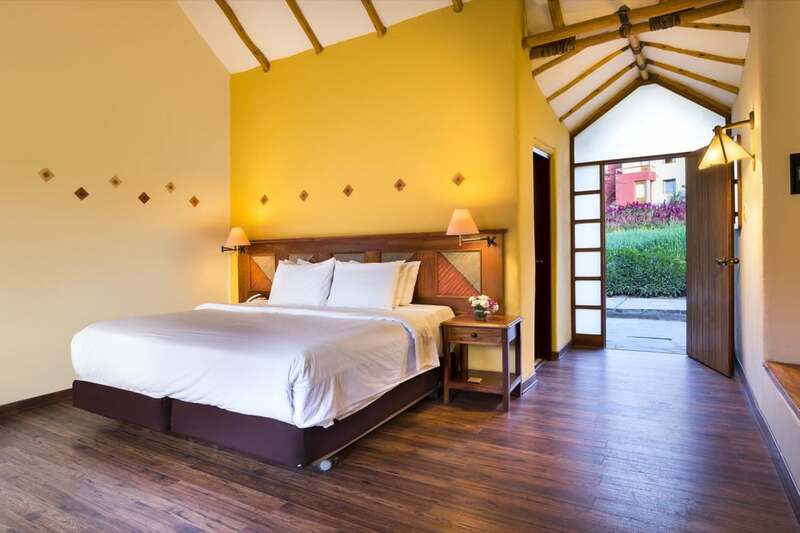 And there’s no getting away from the outdoors, the rooms connect naturally to the beautiful gardens which merge into the crop fields without any dividing walls or hedges; you feel very much at one with the natural world. Value is placed on this being an escape from civilisation and the lack of Wi-Fi and television is welcomed, they are available in the bar and relaxation spaces but you honestly won’t want them. 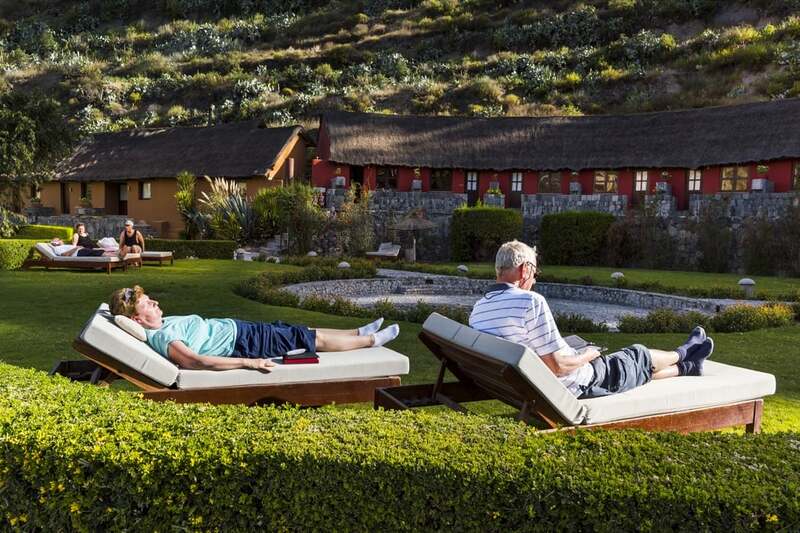 A major benefit of Colca Lodge’s unique location is the amazing, relaxing thermal springs available for you to use and very welcome after a long day exploring. Make sure you take a dip at night as well as during the day, the lack of ambient light gives a star show unlike any other. There are four of these blissful thermal pools, each with a different temperature and each with water rich in lithium – an element which encourages relaxation. To up the pampering a notch, there’s also a Spa at the lodge which has a stunning view of the valley and to further add to your relaxation, all the treatments are started in its own pool; sheer heaven. 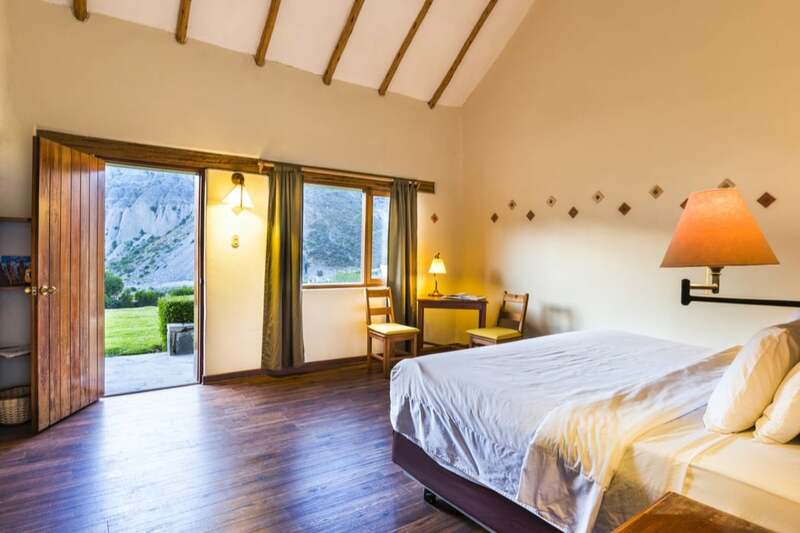 There are 45 rooms at the lodge, all have hypnotic views of the surrounding valley, gardens and patios and most enjoy a creative heating system which uses heat-radiating stone slabs warmed by the lodge’s own geothermal energy sources. 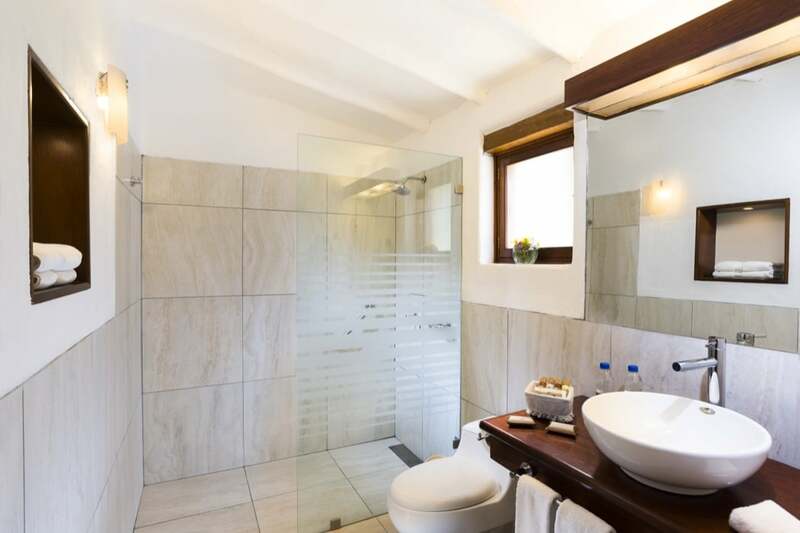 There are double, triple or quadruple rooms but the spacious suites are definitely to be recommended; they have beautiful terraces perfectly positioned to make the most of those stunning vistas. Due to the remote location, you will generally want to eat at the lodge but this is certainly not a problem; the food is delicious and relies heavily on fresh, local produce. The bar is very usefully positioned right by the hot springs too and they will happily serve you while you relax in the pools.